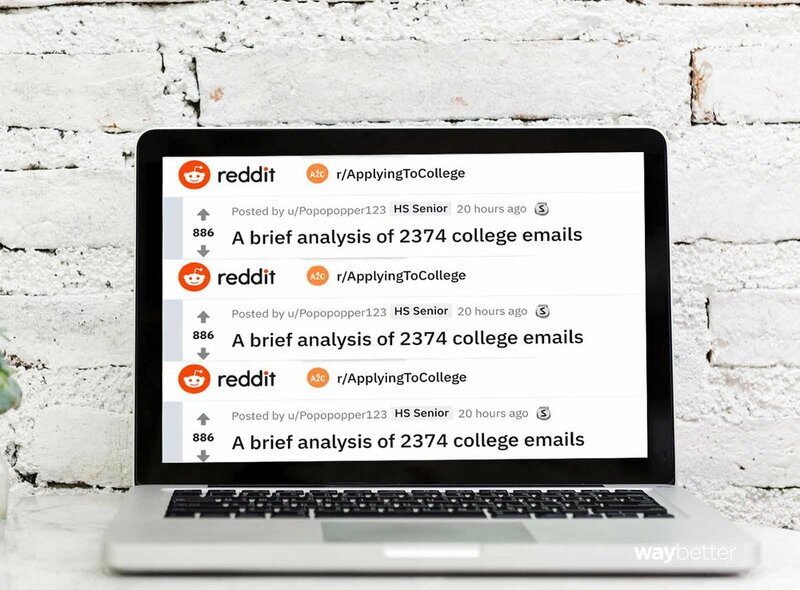 On Monday morning, Reddit user Popopopper123 posted an analysis of the college marketing emails they’ve received over the last couple years, 2,374 of them be exact. The post immediately stood out in the r/ApplyingToCollege subreddit for its thoroughness and sheer volume of information. It was also extremely well written and occasionally hilarious (be sure to catch the bit about naming conventions in Pennsylvania’s state school system). If you haven’t already, you should give the whole thing, including the comments, a quick read. Not too long after the post went live, it started zinging around higher ed admissions, enrollment, and marketing social media circles. It’s about as close to viral as we get in this industry, hungry as we all are to understand the preferences, desires, and whims of the students its our job to recruit. Because I was so taken with the depth of their analysis and the quality of their writing, I reached out to Popopopper123 to see if they’d be interested in being interviewed about what the whole process of being marketed to by the higher ed industry has been like. They agreed, but with a couple ground rules in place. First, no identifying/specific real-world information about them. Second, they did reveal that they applied to and were accepted ED by a very good school (trust me, you’ve heard of it), but they asked me not to name it. I agreed to both stipulations. 1) A focus group of one can be very illuminating (as this one is), but it’s also extreme grain-of-salt territory. 2) Popopopper123 is not a “typical” college applicant. In a comment on the thread, they shared their test scores and GPA. Are you ready for this? 1540 SAT, 36 ACT, 4.2 weighted GPA. This is true outlier stuff. So let me repeat, Popopopper123 is not representative of the types of students most colleges in the U.S. can realistically hope to recruit. 3) Popopopper123 mentioned in the interview that their parents have saved enough money so that no loans/debt will be required to pay for their education. So, again, we’re dealing with a fairly rare demographic here. With those caveats in mind, here’s the interview. First, thanks for agreeing to do this. As I said in a previous message, your post is getting a lot of traction in higher ed enrollment, admissions, and marketing circles. Vice presidents of enrollment and deans of admission are tweeting about it and commenting on it. So, nice work getting everyone’s attention! What made you decide to analyze all your college emails this way? If I'm being totally honest, I knew this kind of post would at least get a good amount of attention on this subreddit, since people complain a lot about college emails here. I was also just curious about things like how many colleges sent me how many emails, which ones sent me extra perks (like fee waivers, automatic scholarships, deadline extensions, custom apps, etc. ), though I ended up only writing about custom apps and deadline extensions. 2,374 emails is a lot. What was it like to be on the receiving end of all that marketing? I'm still just a high schooler, so it's not like I really use my email for all that much. I know a lot of people get really annoyed at college emails since it clutters up their inbox, but for me, I just clicked on them once to mark them as "read" and went about my day. Sometimes when I got an email from a college I was already interested in, I would read it, or if I knew that a certain college tracked demonstrated interest, I would click the links in it, but other than that it really didn't affect me that much. Do any of the emails you received stand out as being especially effective or memorable or helpful? This was for a different email address of mine, but Swarthmore sent me a lot of emails, and I kind of got a "hello there fellow kids" vibe from them. You may have seen in the comments that I posted a screenshot [pictured] of one of their memes. Honestly, though, I think it kind of worked. If I hadn't gotten into my ED school, I probably would have applied there. In terms of emails that actually got me to apply, the only one I can think of would be Fordham, because they sent me a fee waiver, I already knew about them, and they have a non-binding EA round. Other than that, RPI's emails stick out a bit in my head, but I think that's specifically because they were the first college to send me one of those custom applications. There were a few pieces of (physical) mail that also stuck out to me. One was a deck of cards from Harvey Mudd, and upon opening it, it asked you to find a little code hidden in the cards, and also provided a webpage to enter that code into. After finding that code (using a VR app) and entering it into the website, it prompted me to enter "what do you value" or something like that. However I didn't enter anything into the box since I didn't know if it would affect my application (if I were to apply), so I don't know what happens afterwards. The second piece of mail was a poster from MIT [pictured]. The third piece of mail was a booklet from Bowdoin [pictured]. This was more of a standard college mail booklet, but instead of a picture of campus or the college's name on the front, it had this. Another one was from Macalester College, and it looked like this (sorry for the low-quality image). This was a pretty "typical" letter, but I thought it was kind of funny. The last one was from UChicago. I don't have an image of this one, but basically on the front it said something along the lines of, "We like Sweden a lot here at UChicago," then listed a whole bunch of things from Sweden (The Girl with the Dragon Tattoo, IKEA, Swedish meatballs, something to that effect. Then the last sentence said something like "Oh yeah, one more thing we love taking home from Sweden: Nobel Prizes!" and then on the back there was a timeline of every Nobel Prize won by UChicago faculty or alumni. For the first three (Harvey Mudd, MIT, Bowdoin) I think the reason those stuck out were because they didn't feel like marketing to me. They were all interesting, different, and made me think a bit. 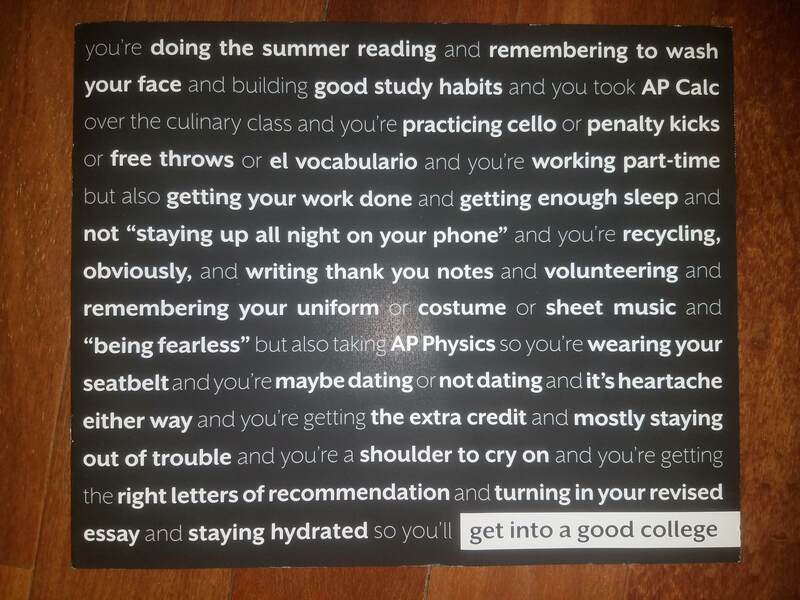 The HMC one had me go through a little scavenger hunt (granted, it wasn't particularly difficult, but I found it fun), the MIT one was a pretty cool poster and had an inspirational quote on it, and the Bowdoin one felt almost like... idk, a self-help or self-reflection book? In either case, I found them either inspirational, or reflective, or thought-provoking. I applied to MIT, and there's a decent chance I would have applied to HMC or Bowdoin if I hadn't gotten into my ED. As for the last two (Macalester and UChicago) I just found them funny. 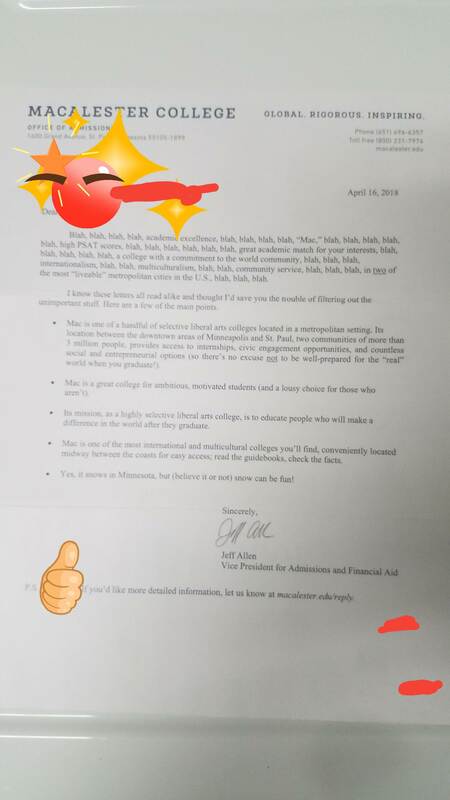 Similarly to the Swarthmore emails, despite the "fellow kids" vibe I got from them, I seriously considered applying to Macalester because of them. Why do you think LSU sent you so many emails? To be honest, I have no idea. I've never even been to Louisiana. I also don't think I'd be a good fit for the school, since I'm not really into partying or sports. It might just be that they send that many emails to everyone. Did you think “cur non” (Lafayette’s motto) was a typo the first time you saw it? No, I just assumed it was their motto, and I guess I was right. I guess I understand wanting to use their own motto in their communications, but they used it to the point that it felt pretty contrived and forced. You point out several schools that all sent you “custom applications.” Many of these same schools offered you “deadline extensions.” And many of them sent emails with some variation of the subject line “Am I reaching you?” Would you be surprised to learn that all these colleges are clients of the same marketing company? They are. Did you already know that? I'm not surprised at all; I suspected as much once I started to receive custom applications from multiple schools, especially since most of those emails had a similar format and they all sent me a "username" which was just my last name followed by a few numbers. I didn't know for a fact until now though. I don't know too much about marketing, and I wouldn't be surprised if those tactics really did help increase applications and enrollment, but to me, it almost made them seem desperate for applications, what with the clickbaity subject lines and their constant urging for me to apply using their special application. A few other colleges sent me fee waivers with emails using a similar formatting as the "custom app" emails, including Fordham and Ohio University. I wouldn't be surprised if they also were clients of the same company. What do you think about getting emails that are virtually identical from a bunch of different schools? I don't really think much at all when that happens. I'd probably just assume that they're using the same software or are clients of the same company. In one of your comments on your original post, you point out that in some of the emails from one school they included a “sent from my iPad” line at the bottom. This was… obviously not true, as you can’t send hundreds of thousands of emails with tracking code included in them from an iPad. Why do you think they did that? I'm not sure. My best guess would be that they wanted to make it seem as if the person sending them (in this case Hofstra's dean of admissions) personally wrote and sent each email, even though that's clearly not true. What should colleges do to make their marketing emails better? Don't mention rankings. Stats and numbers mean very little to me without context. I'm not going to apply to your college just because it's ranked #1 in innovation by US News, or it's the #2 best regional college in the Midwest or whatever. And it's great that 80% of your student body had internships, but what does that mean? Was that by their senior year or by their second year? Don't tell me to do anything. If anything, a college urging me "to apply ASAP!" just makes me want to apply to them less. Rather, ask me to consider your college, and to do my own research. Do try and engage me. Whether it's through humor, or appealing to my values/sense of purpose, the college emails that actually stuck with me were the ones that made it seem like a place where I'd be happy. However, this is specific to me. I'm personally not impressed by rankings or stats, but other people probably are. I think it's more important to realize what people are looking for in a college degree. For me, personally, of course I see college as a place to further my career, but as I said, I also see it as a place to grow intellectually and as a person, where I can find myself in a community of people who care about ideas. But that's not the case for everyone. Some people care about prestige in the job market. Some people care about saving as much money possible in order to have a better starting point after graduation. Some people care about having a tight-knit community. Some people care about landing an internship ASAP. And some people care about partying and coasting through school to end up with a degree. I think it's important to understand what kind of person fits your college, and then focus on those people. Other than email, how else did colleges try to market to you? I’m sure you got tons of regular mail. But what else? Ads on social media? Text messages? Adults in my industry spend a lot of time and money trying to get the attention of people your age (and younger). What advice do you have for them? What should we do that we’re not doing? What should we do less of? What should we do more of? To be totally honest, I don't have a lot of big generalizations about people my age. I'm not the most outgoing person, and most of my interactions with others are in either my relatively small friend group, or online. I also think my viewpoint is a little skewed, since most of the colleges I've considered are pretty well-known already on a national level, and I did a TON of research going into the process, so I already sort of knew what I was looking for. However as I mentioned before, I think appealing to our own senses of purpose and direction is important. I think a lot of people in my generation are suffering from a lack of purpose, in that they don't know what they want to do with their lives and feel as if college is just another thing they have to do to get a job. I don't know if that's helpful at all, but hopefully you find it so. People my age also hate clickbait, including me, and I think it's just a bad idea to use clickbaity subject lines in emails. Even if it leads to more applications, to me (as I stated earlier) it just makes the college look desperate for applications. I know that it's definitely changed my perception of RPI; I know that RPI is a great engineering school and its graduates are often sought after by companies, but now the first thing that comes to mind when I think "RPI" isn't "great engineering school", it's "that college that sends me a ton of emails". Going off that last point, it's extremely frustrating when colleges specifically ask me to apply early decision. For me, the decision to apply ED to [redacted] was not something I took lightly, but meanwhile RPI sent things saying "now is your final opportunity to apply Early Decision II to Rensselaer Polytechnic Institute. Please apply by midnight tonight", and for a college to push it on me like that just seemed distasteful. Most of the college emails I got said something along the lines of "January Xth is the deadline to apply to _____ University ED II or RD" but RPI specifically pushed EDII and left RD as a little afterthought. It almost seemed as if they were trying to hide the fact that EDII is binding. I know I've talked about RPI a lot, but one last thing I've noticed is that the image of them that I get from their emails is completely different from the one I get when I visit their website. Their website has the phrase "Why not change the world?" prominently displayed, something I hadn't even seen in any of their emails, and they emphasize all the great research and discoveries and research they do, and throughout the website they've scattered pictures of their scientific equipment, students engaging with professors and facilities, and images of new buildings and students on campus. The image I get of RPI on their website is that of a world-class research institute with cutting-edge facilities and innovative, motivated students, but the image I get from RPI's emails is, again, that of a college desperate for more applications. Frankly, if RPI had sent emails conveying the sort of image that they put out on their website (and I hadn't gotten into [redacted] ED (and I hadn't heard about RPI's ongoing drama with their president)) then I probably would have applied RD. It's honestly a little disappointing how incongruent RPI's website and RPI's marketing emails were. Another thing is that we all know that admissions offices send emails by the thousand. Any illusion of personal connection is broken as soon as we receive the exact same email from a different college. Instead of writing emails with few to no visual elements to make it seem like it's coming from the "dean of undergraduate admissions," going so far as to include "sent from my iPad" at the end, I think it's better to send emails with more attractive, distinctive designs that stick out better in our heads. Arizona State especially stood out for having good visual elements in their emails, even though I didn't apply there. They even included a cute little cactus with Christmas lights and snow (even though I'm pretty sure ASU has seen snow maybe two or three times in its history lol). I guess one last little tip is that kids these days love ironic humor, but hate when adults, and especially marketers, make jokes in order to seem "hip" and "in with the kids". Your grades and test scores are really good (congrats! ), so I assume you’ll have plenty of schools to choose from. But can you talk about what’s important to you in making this choice? Rankings? Programs that interest you? Location? Cost? As I mentioned earlier, of course I care about good job opportunities, but I also cared about being in a community of people who care about things, who are willing to just talk about abstract ideas because they find them interesting, and where I'd be able to grow intellectually and personally. As for programs that interested me, I was initially interested in engineering because I like building stuff, but I've found that my interests have become more broad and more focused on the big picture, and I sort of drifted over to math and physics as my intended major/majors. As for location, I didn't care quite as much about that. And as for cost, I'm lucky enough that my parents have been able to save up to pay for college in full, so no matter where I go, I won't be taking on any debt. While rankings were somewhat important to me, I didn't really care about the specific rank of a school, more that it was reputable and near the top of its field. How many colleges did you apply to? I applied to fourteen colleges. Other than [redacted], most of the colleges I applied to were out-of-state public schools that were either well-known for physics (like UIUC or Berkeley), were in-state (like UVA or VT), or I applied to them last minute since they had no supplements (CWRU, RHIT). I know you said you don’t want to provide identifying details, but can you tell us a little more about yourself? What are your main academic/extracurricular interests? What do you plan to study in college? Academic interests: I've always liked science, but especially physics and math. Bio and chem are great and all, but the purity of math and physics just sort of appeals to me, not to mention the fact that they're both really useful in the real world. Extracurricular interests: I've done a bunch of stuff, like I briefly did debate and science olympiad, but I've found that my two main "things" are either messing around on my own with making stuff (I have a 3D printer) or programming stuff, as well as music (I play an instrument and am in the marching band). I also spend a possibly-unhealthy amount of time online reading stuff and occasionally making memes or writing stuff, kind of like the post you saw. Major in college: I'm debating between math and physics, and possibly considering econ or maybe one of the humanities as a minor/second major. Thanks so much for these really thoughtful responses. I think my colleagues at marketing agencies and in marketing offices at colleges will find this very interesting. And I know your interests veer towards STEM, but you're also a really good writer and lucid thinker. Don't rule out taking some literature/writing courses in your college career—I think you'll find you have a knack for it. Oh, and if you ever want to intern at a marketing agency, let me know. We pay our interns here at Waybetter, and you’d get great experience. I might be interested, but I'd have to know more before I just decide yes or no. Take all the time you need. This is not an ED binding situation. Joel Anderson is Waybetter’s VP of marketing & strategy. Follow him on Twitter.